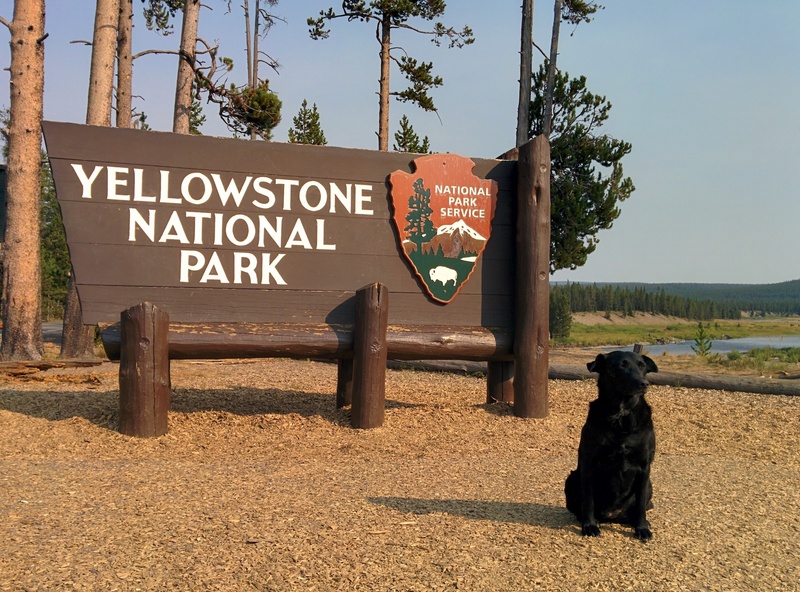 Just up the road from Grand Teton National Park sits America’s first National Park, Yellowstone. 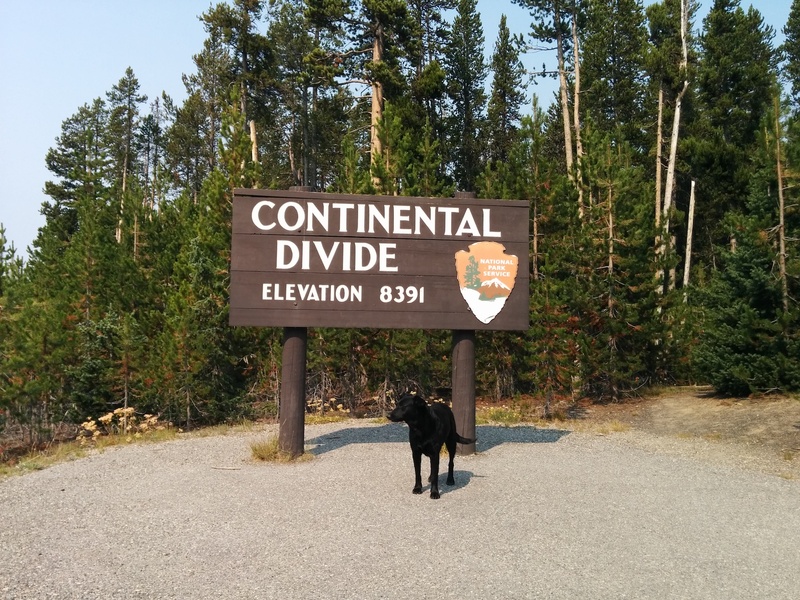 Since we were planning on heading up into Canada eventually we were heading due North and that put Yellowstone next on our path and in our sights. On March 1, 1872, with the stroke of a pen, President Ulysses S. Grant created the first national park in the U.S. which also happens to be widely recognized as the first national park in the world. Spanning an area of over 3,468 square miles (8,983 km2) it encompasses parts of three states; Idaho, Montana and Wyoming although the vast majority, 96% is within the state of Wyoming (with 3% in Montana and the remaining 1% in Idaho). 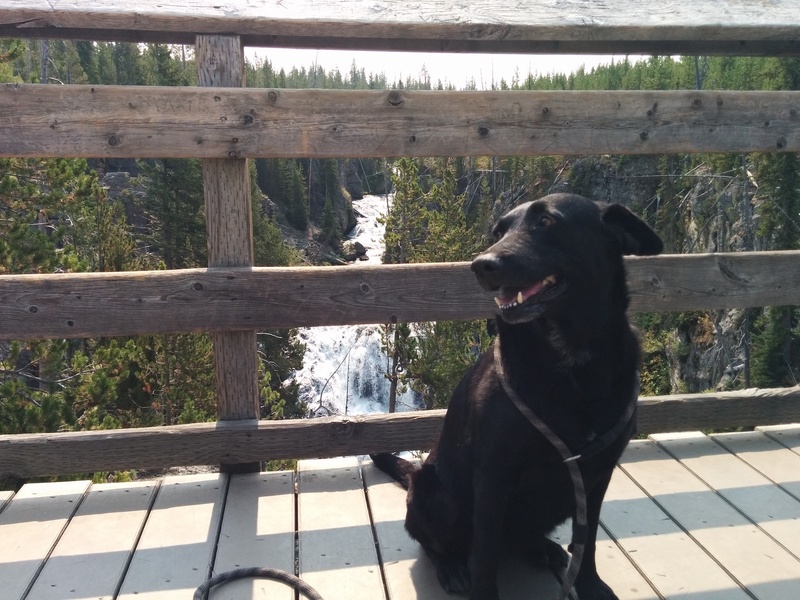 The last time I visited I was all of 12 years old so the time was right for a return visit with my furry traveling companion. Since the weather was nice and we had gotten a bit of a late start getting out of our campsite next to Grassy Lake we were met with traffic and crowds almost as soon as we reached the Park’s South Entrance. Not wanting to fight the crowds we decided to take the day and do an easy drive through the park to scope out the sights and plan what we might come back and see tomorrow. We planned to stop at spots which were not afflicted with and affected by traffic and crowds and save the busy spots for earlier the next morning. About one mile past the entrance we arrived at the turnout for Moose Falls. Only one car was there before us, we saw no signs forbidding dogs and so went to take a look. The “hike” was actually just a short, 2 or 3 minute walk until we could see the falls. We waited for a couple to gaze longingly at the falls (conveniently right in the spot we wanted to position Willow for her pictures) for several long minutes until they then pulled out their camera and proceeded to monopolize that spot for several more long minutes to take dozens of photos, making sure to review each picture on the camera and decide whether or not it was worthy of deletion before taking another. They saw us standing there waiting and didn’t make any attempt at efficient use of their (or our) time. Eventually they seemed satisfied and stepped out of the way to allow us our picture-taking opportunity (thanks). These are going to inevitably end up being those old folks who wait in line at a grocery store while their purchases are being rung up and only after they see the total, then they start digging in their purse hoping to find their checkbook. All too common. We took these three pictures (and a couple more that didn’t make the cut) in about one minute. You’re welcome. The people who had arrived after us and were also waiting for the slow pokes were obviously impressed and thankful for our efficient photo-taking process and Willow’s posing talent. We headed back towards the Tacoma and walked past the Slowskis beating them to the parking area! Not that it is a race; it isn’t, but a bit of friendly efficiency would be proper and welcomed…especially when there is a line of people waiting to take a photo. We took a leisurely drive up Hwy 191 keeping our heads on a swivel and her nose poked out the window doing a prolonged Turbo-sniff. About 20 minutes along we came to the impressive Lewis Lake on our left and soon after, right at the Riddle Lake Trailhead, we saw a Continental Divide. 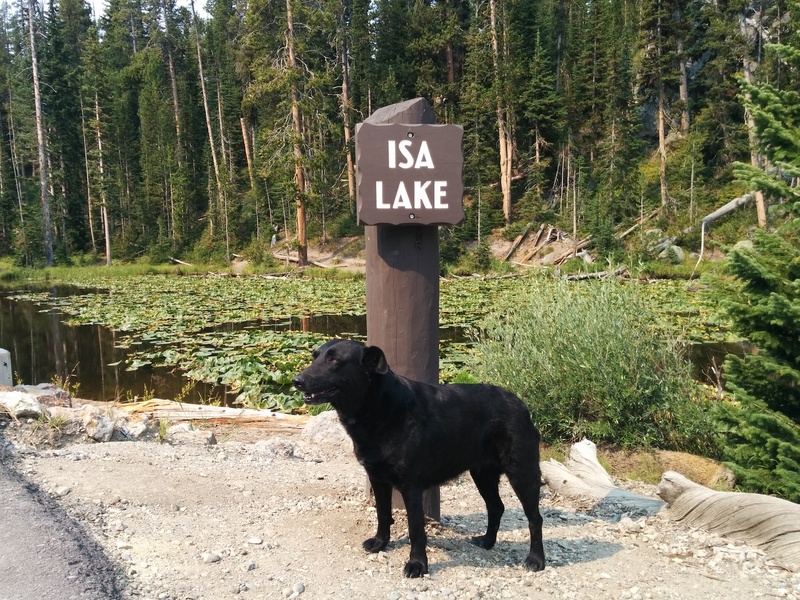 A little less than 6 miles further along the Grand Loop Road we pulled into another turnout and were met with the little beauty Isa Lake. Situated along the continental divide at Craig Pass this little lake has the distinction of being the only natural lake in the world to empty into two different oceans… and do so backwards! When springtime runoff swells the lake it overflows its tiny borders. 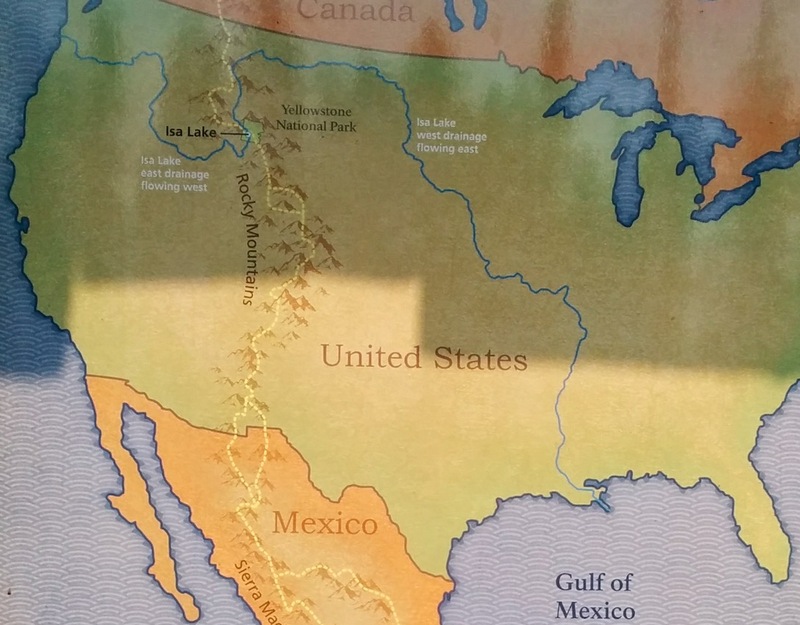 Now here is the interesting part of it: the East drainage flows out, changes direction and heads to the Pacific Ocean while the West drainage performs its own flip and makes its way towards the Gulf of Mexico. We used this nice little spot to have a quick snack and beverage break and use the vault toilet there (Willow used a little grassy area over to the right). Less than five miles further along the road we saw a long parking area which we hoped indicated something beautiful. 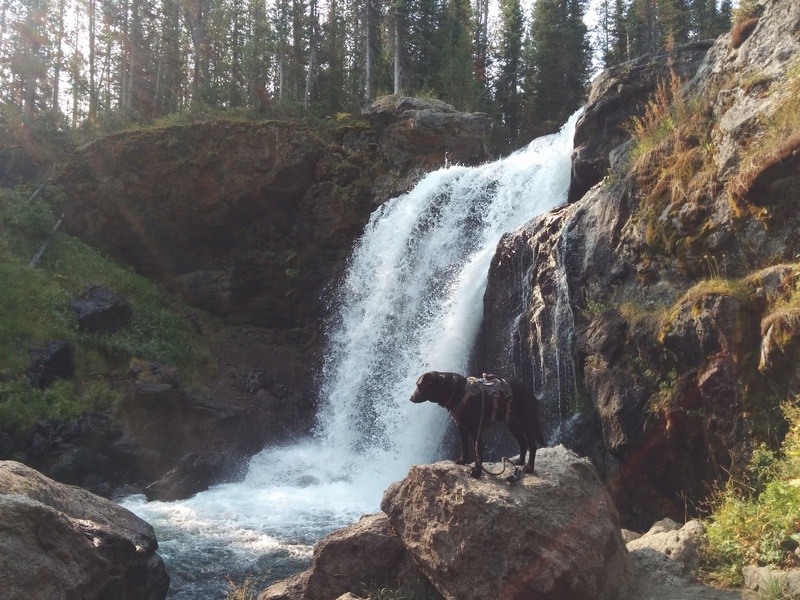 What we found was the Kepler Cascades. 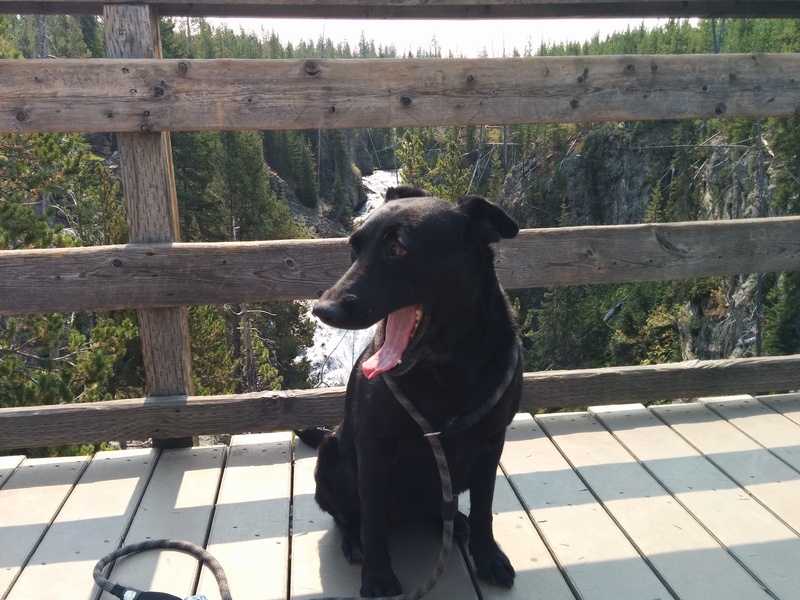 A whopping 30 meter walk from our parking spot took us to a wooden observation platform overlooking the Cascades themselves to one side and the Firehole River flowing away the other direction after being abused by the falls. Walking back to the Tacoma we were drawn to a shout. 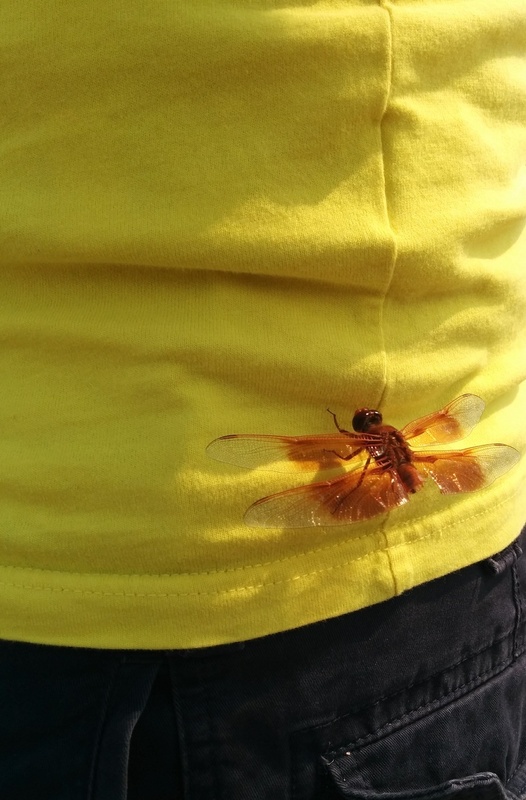 Walking over to the commotion we found a couple of adults and their one offspring, obviously from another country and terrified of a (once) beautiful rust-colored dragonfly that had decided to perch on the gentleman’s bright yellow shirt. 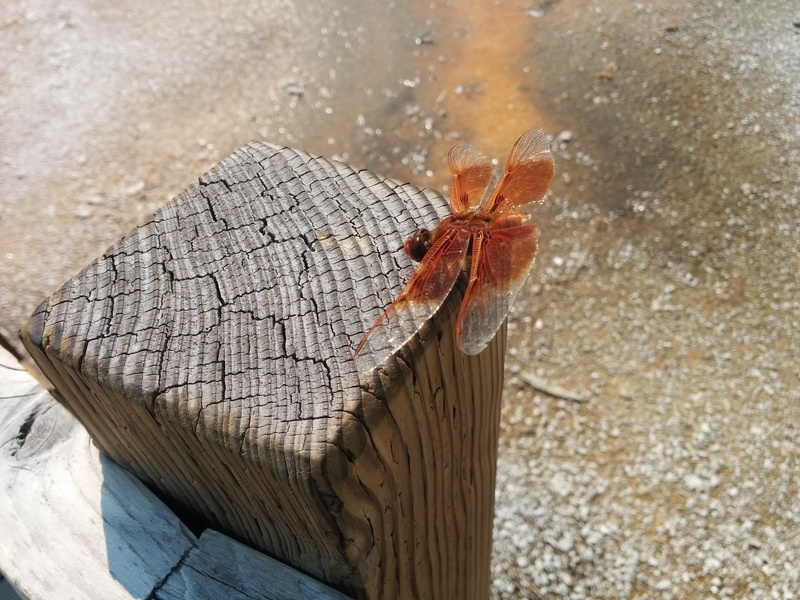 Dragonflies have been around for upwards of 300 Million years and are the most maneuverable flyers on the planet. We think they’re awesome creatures. As you can see, through some misadventure it had lost its abdomen and although still alive and able to fly (slowly and awkwardly) it was not long for this world especially attached to a panicking tourist and his hysterical wife. I offered to remove it and they readily agreed. 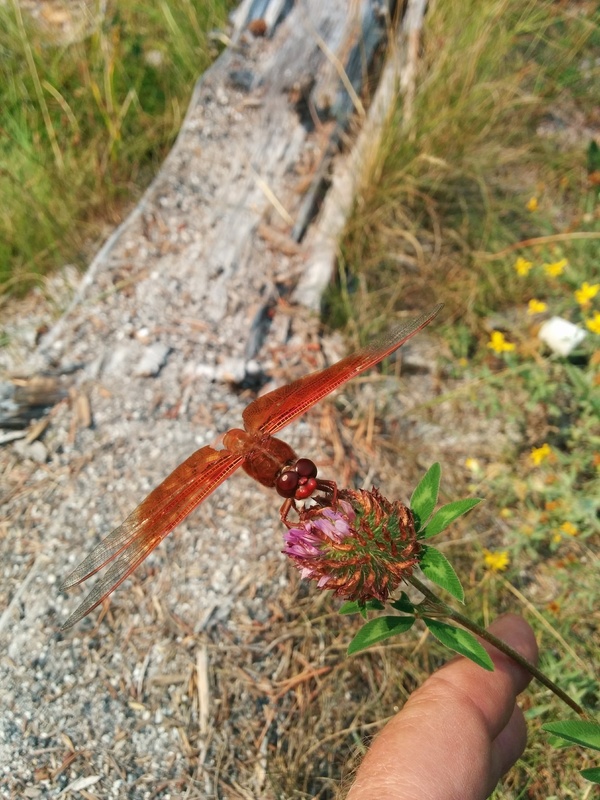 It seemed to want to walk onto my hand with only the barest of nudges. I first moved it to a wooden post to observe it a bit longer and allow some of the other people who had come to see what the commotion was about to take a closer look. Curiosity satisfied the crowd wandered away so I moved it to a nice, large flower gently swaying in the light breeze to live out the remainder of its life in peace. Good deed done for the day we got back on the road and found that we had to bypass several standard sights. 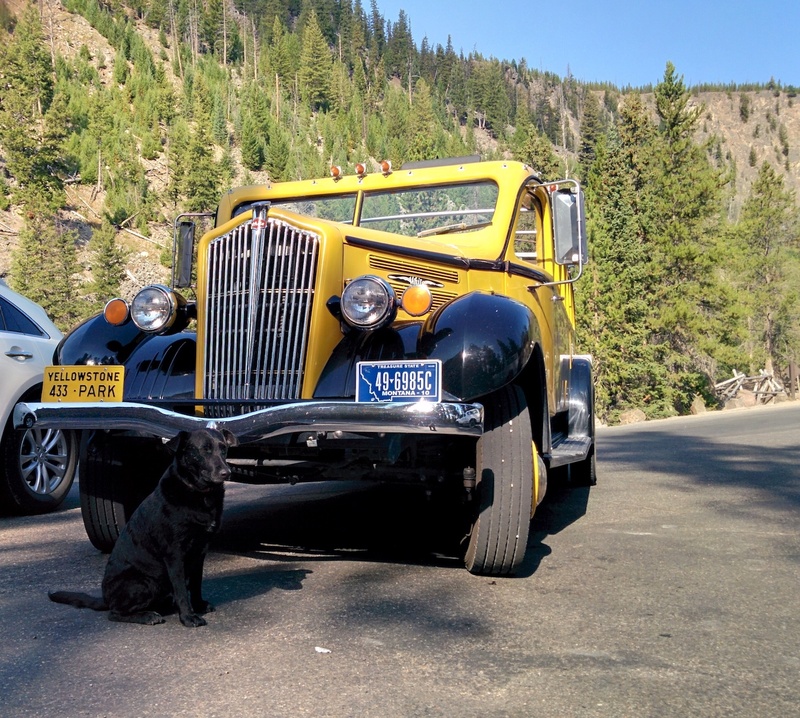 There were a few reasons to keep moving; so many cars, buses and people crowding around there was nowhere to park and the ever-present, thick, sulfurous stench wafting about and curling my delicate flower’s amazing nose were the two main ones. 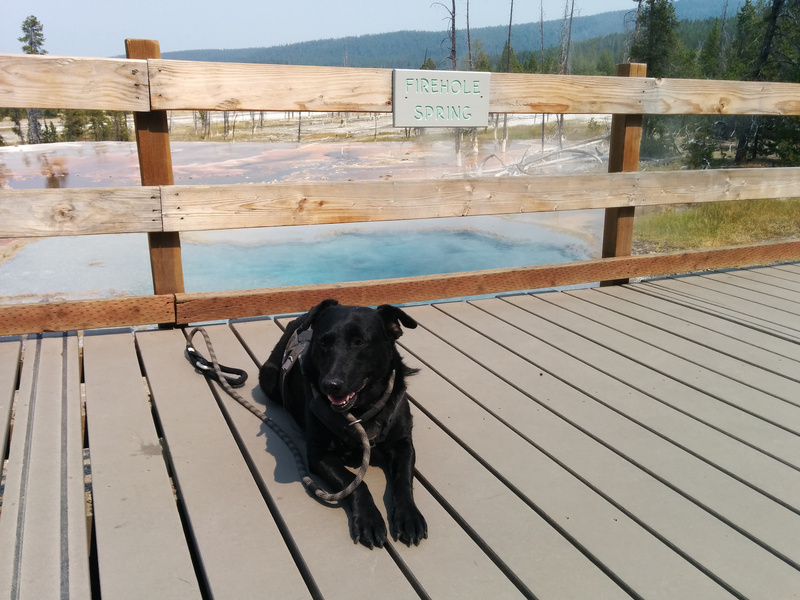 This meant we had to skip such famous sights as the Biscuit Basin with its Sapphire Pool as well as the Grand Prismatic Spring and nearby Turquoise and Opal Pools which was a shame. 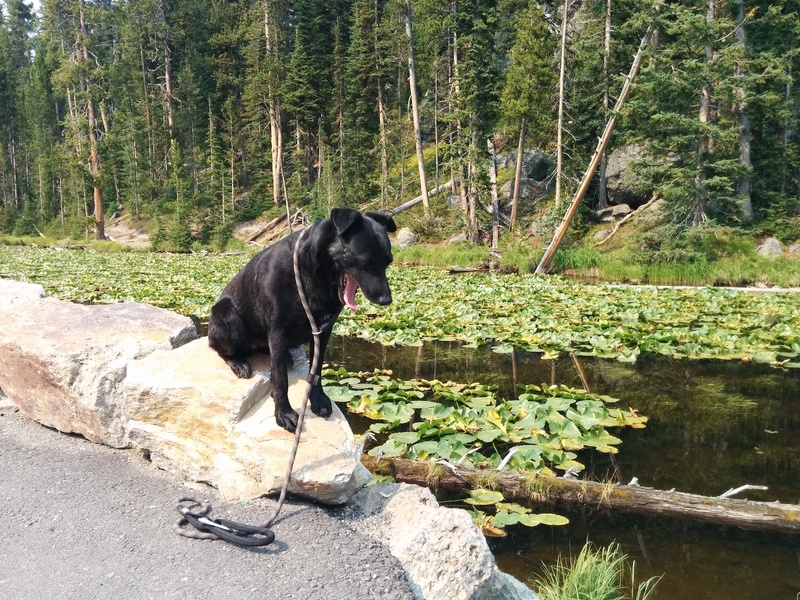 To see if we could remedy this and get away from some of the larger crowds we decided to turn off the main Grand Loop Road and so took a right turn onto Firehole Lake Drive to see what we could find. 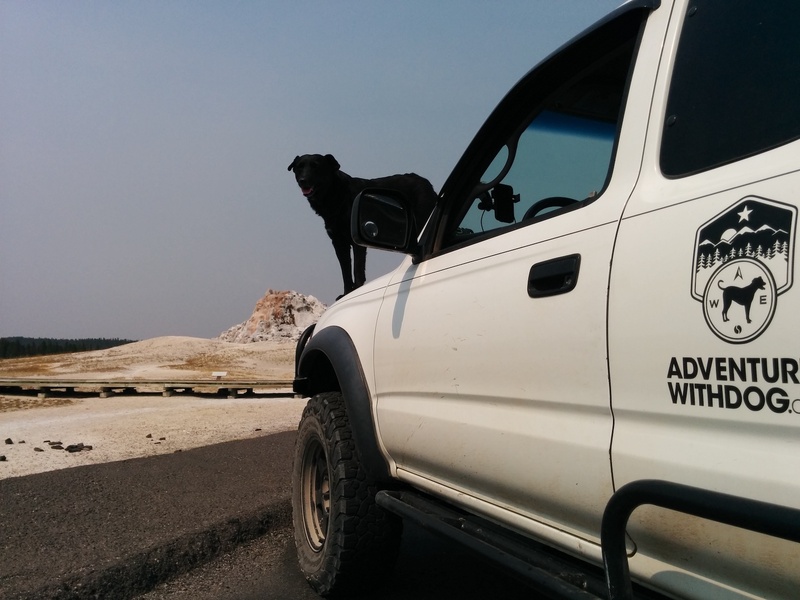 Less than a mile after we turned off we came to Firehole Spring and parked to get out and take a look. One thing we found interesting was how we could see regular gouts of bubbles or steam or something with an obvious white tint erupting from deep down in the spring and making its way to the surface…but more often than not just disappearing and only occasionally breaking the surface like we would expect. 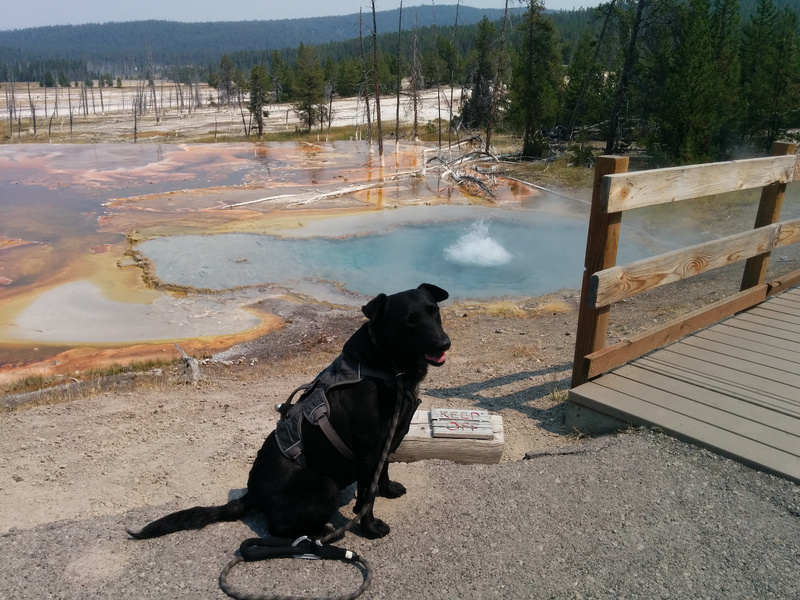 Our next stop was the White Dome Geyser which was doing all it could to make Willow’s delicate nose fall off with its stink. White Dome Geyser is one of the largest cone geysers in Yellowstone. Its cone is many centuries old. Thermal water travels from underground up through silica-rich rhyolite and during each eruption deposits a microscopically thin layer of that silica which forms into spiny, bulbous masses known as geyserite. In contrast to the dome outside growing ever larger the vent on the inside is growing narrower with each eruption as the same process of silica deposits are adding layer upon layer like rust deposits on the inside of an old iron pipe. A couple of centuries from now the narrowing will cause (if the thermal pressures remain constant) either a higher geyser, will close it down to a trickle or might just blow the dome apart when the pressure has nowhere else to go. Neato. 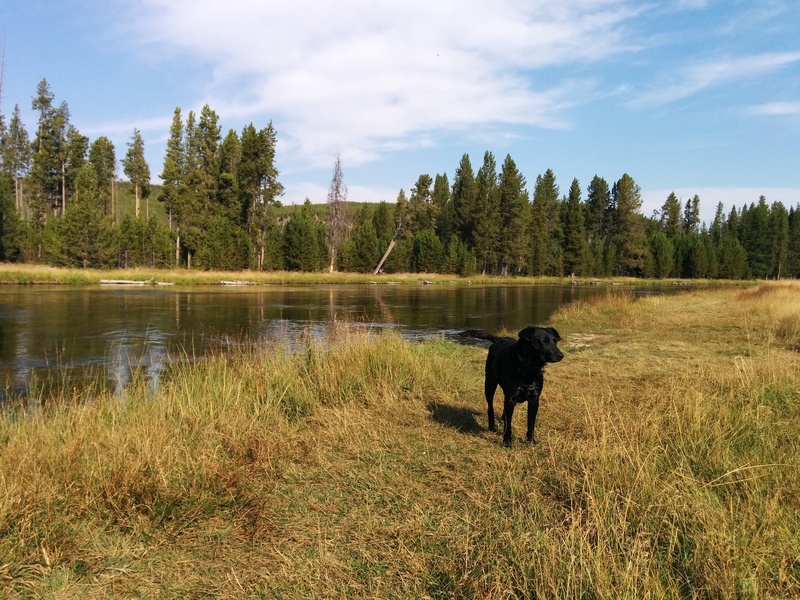 Near a sharp turn in the road sits Firehole Lake itself which loans many features within the National Park its name. Right there is also a relatively large parking area carved out of the surrounding land in between Firehole and Hot Lake and we could see some people out of their cars and excitedly pointing at something. 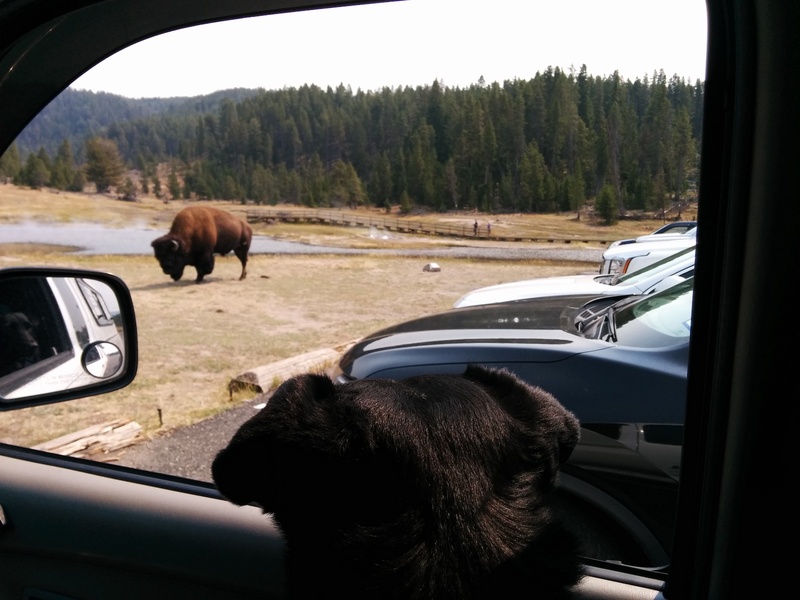 We pulled into an empty spot and found ourselves face-to-face with a handsome bison contentedly munching away on the meager layer of grass next to the parking area. He seemed totally at ease and unconcerned with the small crowd of slow, squishy humans gathering to gaze in wide wonder at his (obvious) magnificence. I got out of the Tacoma and climbed up on the rock sliders to get a better look and take some pictures. I said a few nice things to him and he immediately sauntered over towards us but stopped when an old-school diesel truck pulled up clattering right next to us. I thought we were having a cross-species “moment” but that came to a stop as soon as the diesel pulled up. He did continue his saunter towards us and then stopped, looked right at us and offered his opinion of our presence in his domain. The woman in the diesel had her window down and would just not stop talking so I will spare you her inanities and remove the audio from the clip below. Willow is very well-trained but the chemical warfare game of urine over-marking is one of her favorites and she almost never loses so it was all I could do to keep her from vaulting out of the Tacoma to go show him who the piss boss was… aaaaand inevitably get stomped into a quivering pile of bloody dog meat…which would make me very sad. She had to settle for giving him some serious stink eye through the windshield all the while emitting this little groan from deep within her throat. That’s my girl. His prolonged piss now post-performance the big guy slowly sauntered away still grazing as he went. 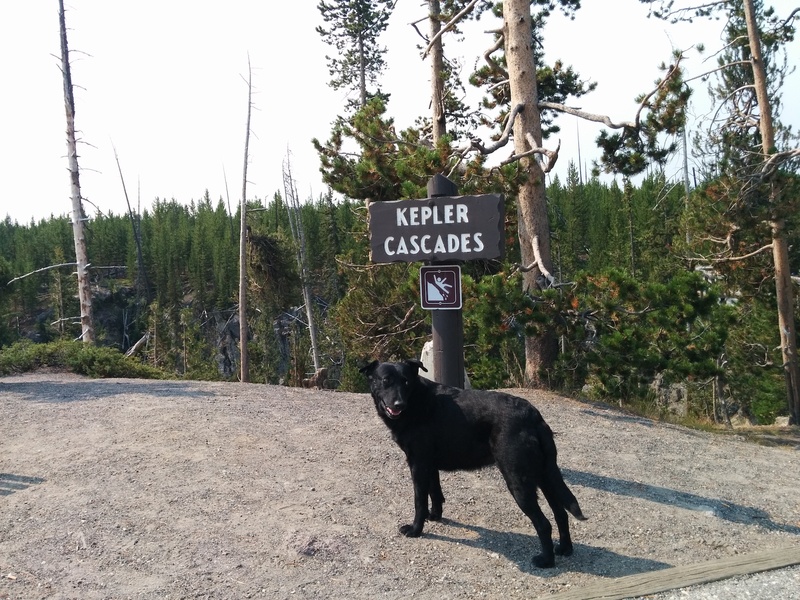 We took that as a hint and continued on our tour around Firehole Lake Drive until we dead-ended back into Grand Loop Road right across from the Fountain Paint Pot Nature Trail. Seeing the parking lot overflowing with cars made the decision to bypass that sight easy. We turned right and continued heading in the direction of the Park’s West Entrance which we would be exiting through this day. At the intersection across the street from the Madison Junction Campground we took the left to stay on Hwy 191. With the Madison River off to our left paralleling the Highway we enjoyed the view of the mountain range to our left (south) anchored by Mount Haynes, named for the first official photographer of the park. At a large curve in the road the river swapped sides and now followed us on the right of the highway essentially until we arrived at the Wyoming/Montana border. It then curved northwards and away from the highway and our view right as we entered the long straight-away that led to the park’s West Entrance. This entrance to the park has four lanes entering under covered “toll” lanes and only one lane leaving the park. Once we got past the congestion at that crossing we made the half mile into the town of West Yellowstone in mere minutes. 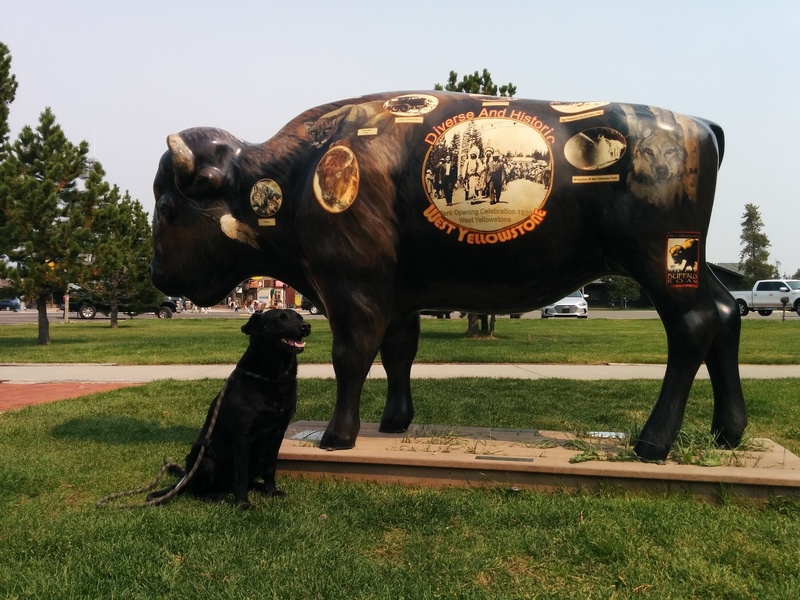 Just down the road we found the Yellowstone Historic Center with a bison that Willow could get up close and personal with. It is made of fiberglass but we will take what we can get. 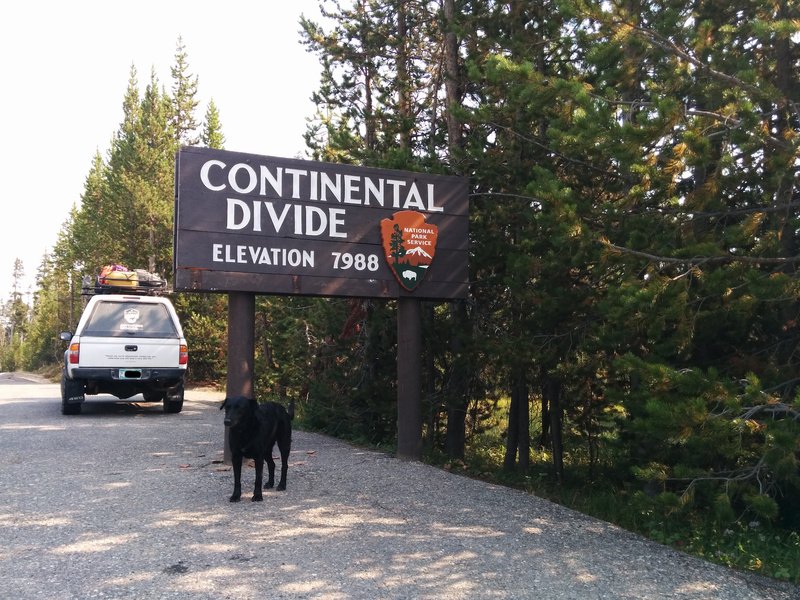 After a quick gasoline fill-up we headed straight out of town due West on the Targhee Pass Highway for about 11 miles, the last two miles of that after crossing back into Idaho. At a hard right off the highway we turned up onto Forest Road 57, climbed up over the first set of hills lining the highway and found a lovely little spot to camp. Once we got the camp situated Willow took a break to have a romp with her favorite little stuffed chipmunk. After an hour-long hike to check out the area around our spot we had a nice, quiet dinner and watched the lovely sunset behind the three mountains lining the Idaho/Montana border near us; Black Mountain, Targhee Peak and Bald Peak. Sleep came in fits and starts that night as something, repeatedly got Willow’s attention and she kept waking me up and asking to be let out to investigate. Knowing she occupies the smaller sized range of predatory animals in the area I declined her strident attempts at escape and kept insisting on a return to sleep mode. When dawn arrived neither of us felt refreshed and so decided to stay in bed a bit longer. When we finally motivated to actually get out of bed and start the day it was already past 8am which meant tour buses and throngs of people were already crowding into many of the sites in the park that we had planned on heading back to. Even had we hurried to break down camp and skipped the morning coffee routine (not gonna happen) we still would have arrived back in the National Park at around 10am which we were not keen to do. That decision made we decided to just relax for the day and catch up on reading (me) and dirt/sun bathing (her). 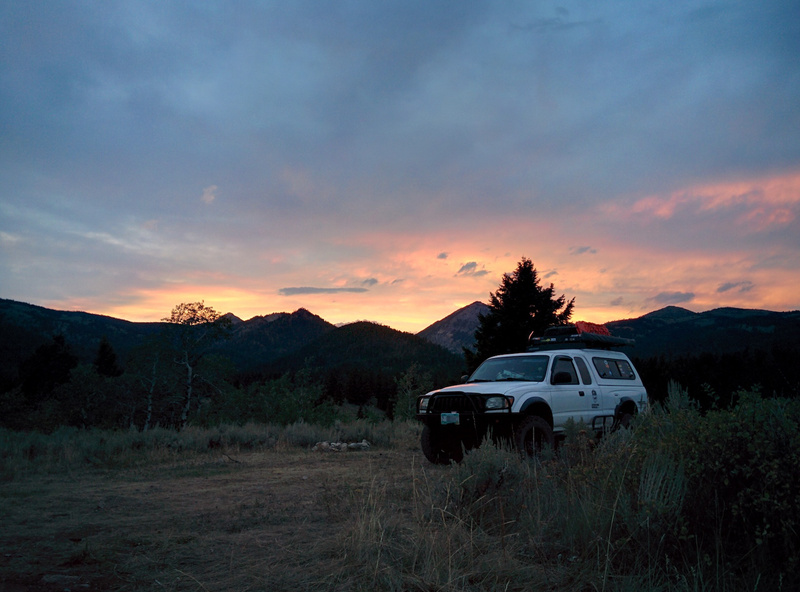 At one point in the day a sheriff arrived in his 4×4 and we hoped we were not camping in a forbidden zone. I don’t dislike cops but still feel better when they are not around and focused on me. 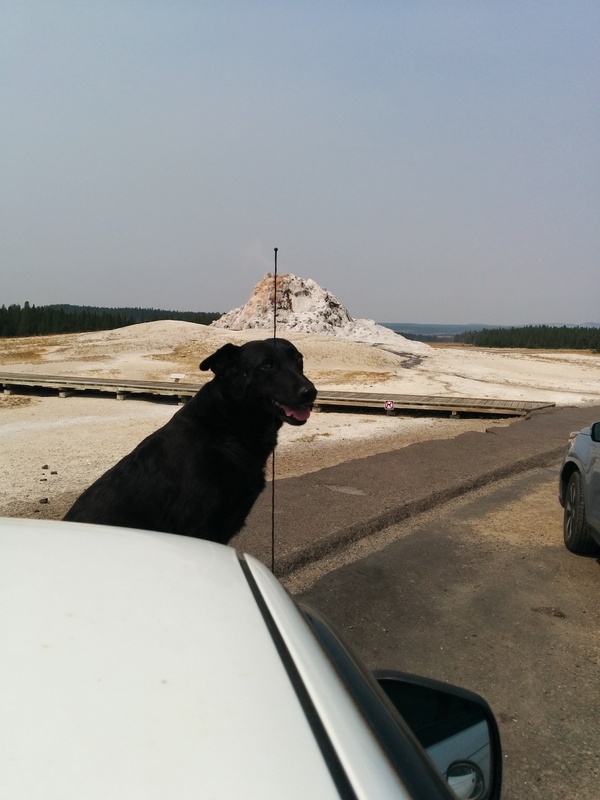 Happily he was just checking to see if we were the ones who had reported smoke from a forest fire in the area. 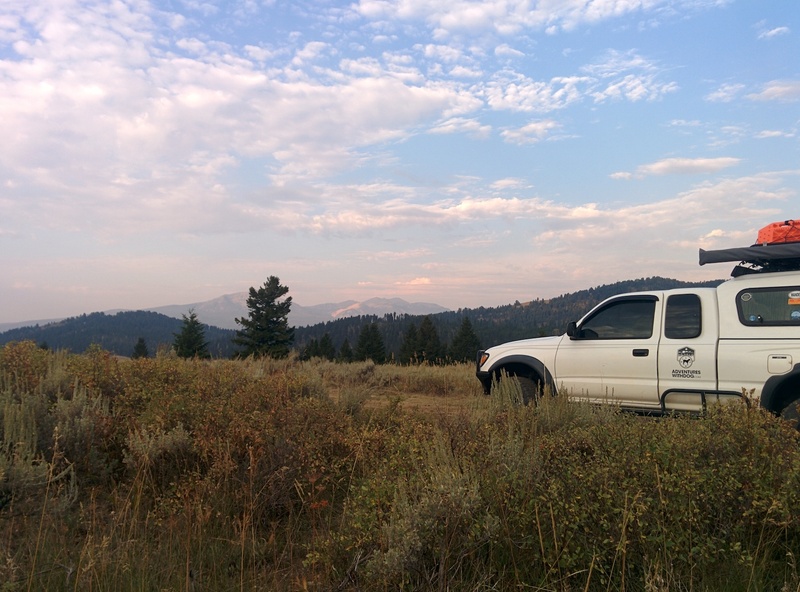 We assured him we had not made the report and had also not seen any obvious signs of forest fires or lightning strikes in the surrounding area but would keep our eyes open. This season was one of the worst on record for forest fires. 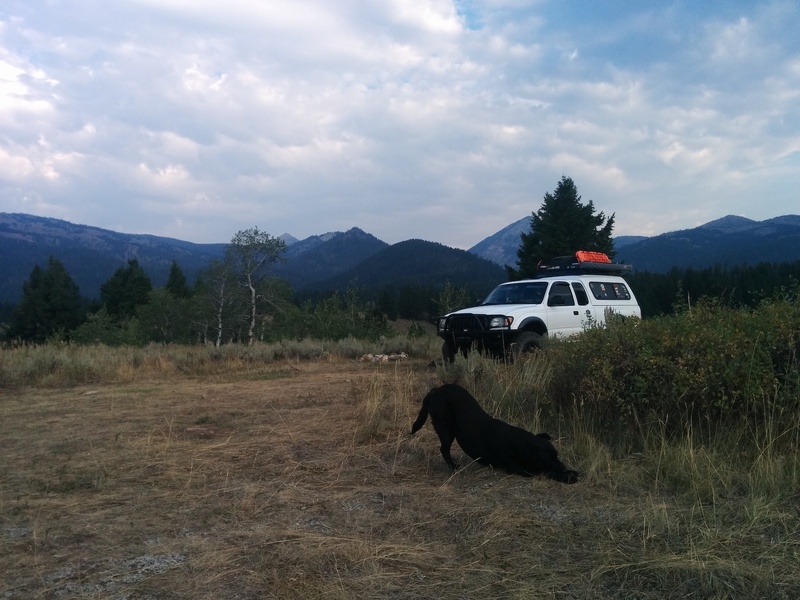 We didn’t know it yet but the fires and their resultant smoke would end up impacting our trip, forcing our hand and dogging our heels for the next two weeks or so as we made our way up into Canada. After a nice day of purposely getting a lot of nothing done we made it a point to take another hour-long hike at a brisk pace just before sundown to tire us both out. Hopefully this would keep Willow from staying up (and thereby keeping me up) all night. We went to bed at around 7, read for a bit and were probably asleep by 8pm so we could get up early, break down camp and get back into the park by 7am or so. We were surprised to see the booth at the entrance station manned when we came through at about 6:45am but we showed her our receipt from a couple of days before and she smiled and waved us through at just about the time sunrise was in full swing. As we retraced our steps from two days before but in the opposite direction we found ourselves at one of the many turnouts (this one Riverside Drive) that strive to focus a park visitor’s attention on a historic, geological or scenic subject. A group of early risers were out of their cars and pointing excitedly down towards the river’s edge and so, of course, we had to stop and take a look as well. 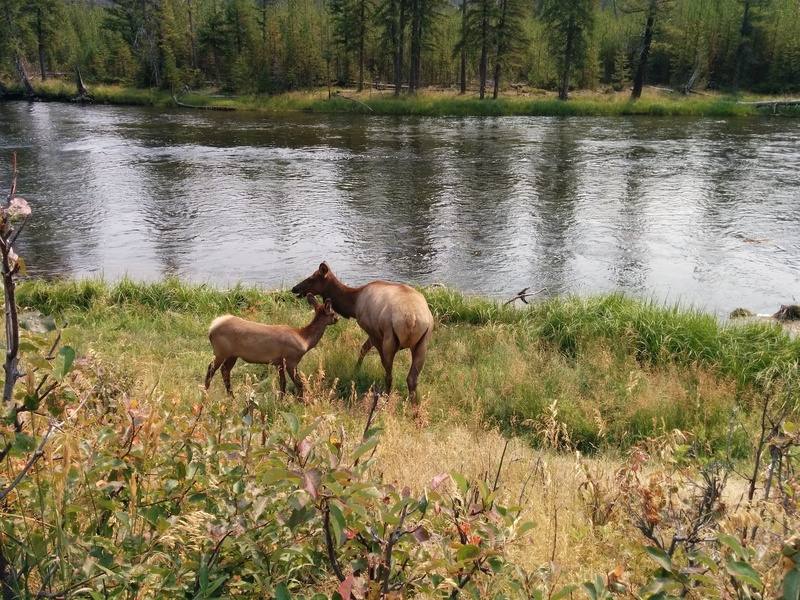 Right at the river’s edge and all of 10 meters from us was an adult female elk and what we are guessing was her yearling offspring happily munching away on shrubs and grasses and completely unconcerned with the presence of us gawkers. Instead of being wary and moving away they actually made their way closer to us which is all the more interesting as Willow was sitting calmly next to me on her leash and sniffing hard in their general direction. We watched for a few more minutes and then slowly and quietly made our way back to the Tacoma without disturbing those two gorgeous creatures. Once we got back to the highway’s intersection next to the Madison Junction Campground we turned right and headed south. Instead of staying on the main drag we turned off on Fountain Flat Drive to see what sights, sounds and smells we might find. We pulled into a small turnout and saw a single track dirt path down to the river’s edge with a small fenced area and steam rising from the water. 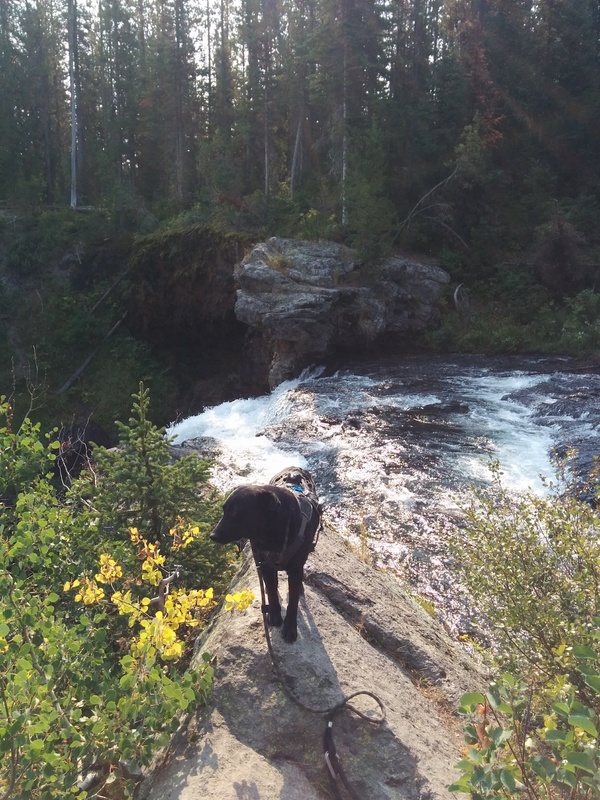 A short 2 minute walk and we discovered one of those fireholes the river (and many other features throughout the park) get their name from. It looked much like a natural hot tub but was probably much hotter even with river water mixing directly into it. 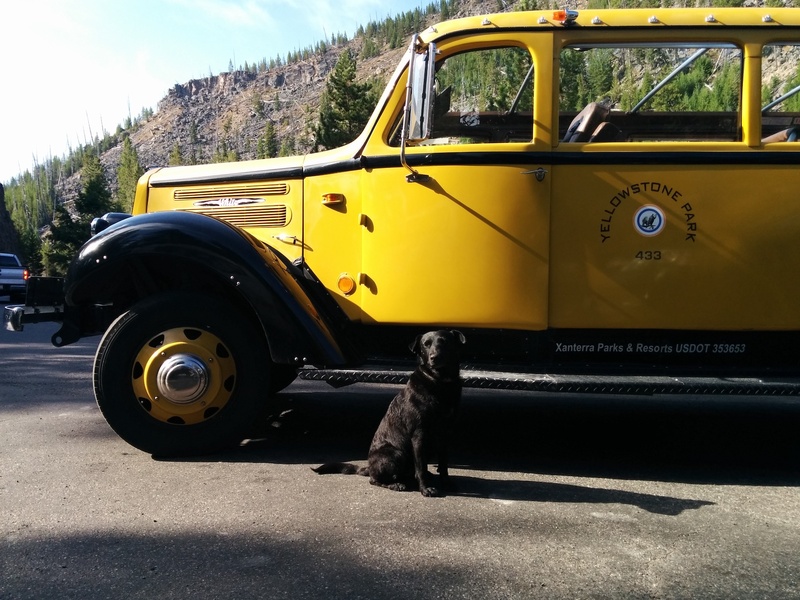 As we were enjoying this new discovery we noticed one of those iconic yellow buses drive by back where we had parked heading towards Madison Canyon. Wanting to take a closer look we walked back to the Tacoma and were able to catch up with the bus right about the time it pulled into another turnout near the top of a hill. 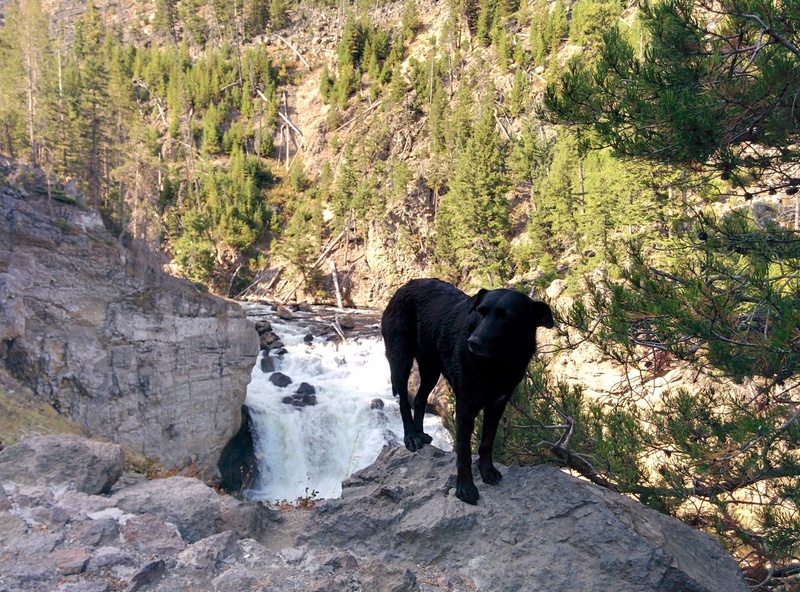 Once the bus passengers had departed to walk across the street and look at Firehole Falls we took the opportunity to take a look at this beautiful example. 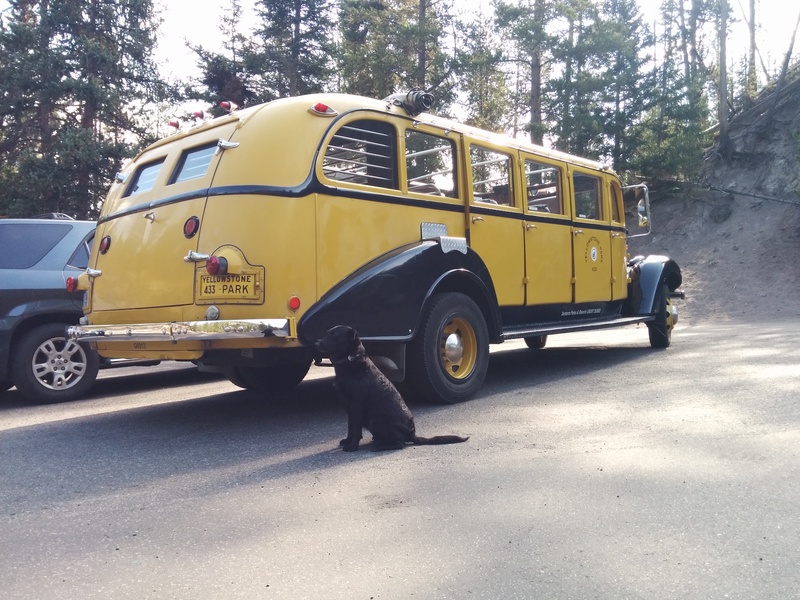 This specimen is a 1936 White Model 706 Tour Bus built by the White Motor Company out of Cleveland, Ohio but customized to be used in several National Parks including Glacier, Grand Canyon, Mt. Rainier, Rocky Mountain, Yosemite and Zion. Holding 14 passengers the bus features two squared-glass windshields, lantern-style rear running lights and measured about 26 feet long. A canvas cover on the roof could be pulled back to allow for an open top and unobstructed views. Yellowstone acquired twenty-seven of these models for the 1936 season. 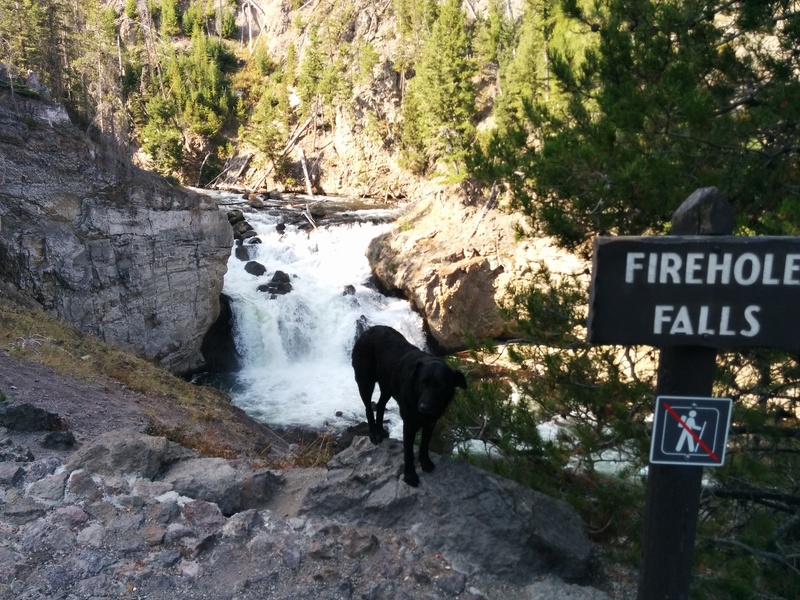 Once the bus passengers had taken in the sights they got back on the bus and departed leaving us the chance to walk across the street and check out Firehole Falls for ourselves. 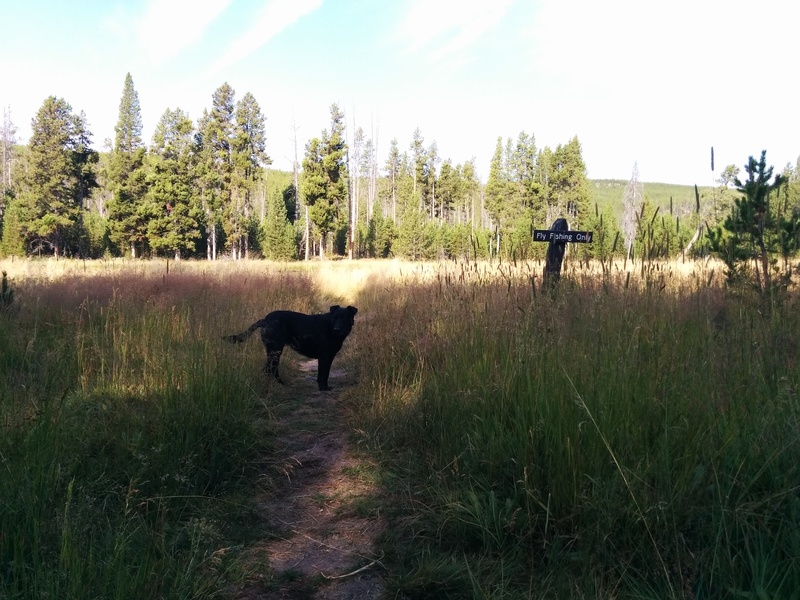 All around us stood the signs of rebirth after the devastating fires that occurred in the park in 1988. 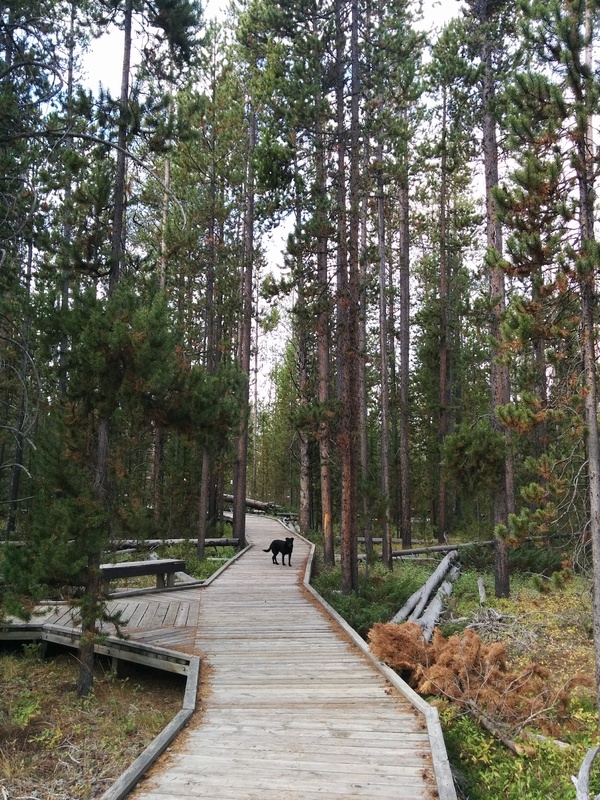 This area is thick with lodgepole pines and fire plays an important role in their lifespans. Here is a new word for the day: serotinous, which means, in this case, the pine cones holding the tree’s seeds being tightly sealed with resin. Use serotinous in a sentence. Okay, “Fire melted the resin in this serotinous lodgepole cone allowing it to open and spread its seeds once the fire had passed.” Fire serves several functions in lodgepole forests such as this after usually being started by lightning strikes (but sometimes by careless campers not putting their campfires Dead Out or scumbag smokers littering their still smouldering butts out car windows). If the fire is fast-moving and burning only ground duff it can easily kill off many destructive insects while still leaving the tree relatively unharmed. The fire leaves behind ash which can fertilize the ground making it more nourishing for the seedlings that will sprout up after being released from their cones. If the fire is more intense and has actually killed larger trees that has the benefit of opening up the older, thick forest canopy and allowing more sunlight through to reach those saplings. 10 years after the 1988 fires the “new” saplings were already several feet high and now, 30 years later the area looks like a functioning forest again. 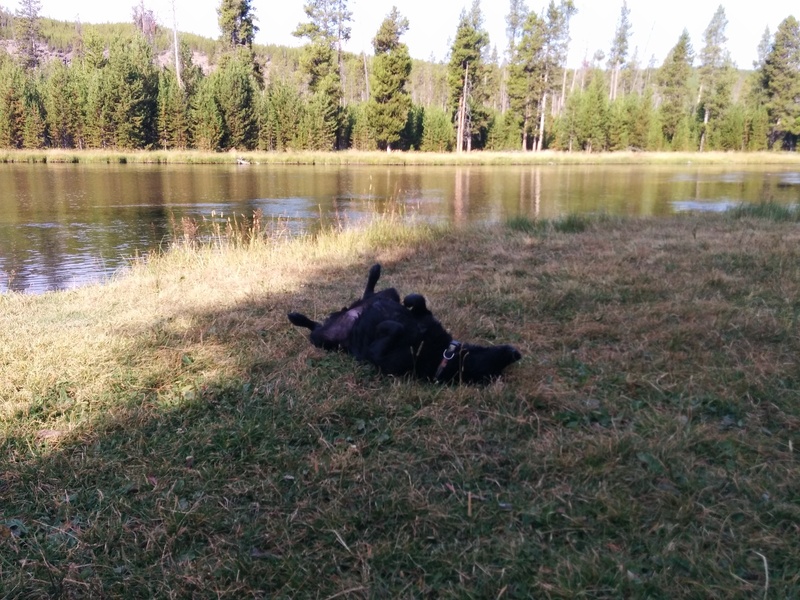 get back out, shake off and roll around in unabashed glee. Since it was now late in the morning the park was again overrun by hoards of tour buses and thousands of thronging tourists (yes, we too/two are tourists but we are not thronging). This, sadly, meant we were again not going to be able to visit many of the sites and sights that the park has to offer. Disappointed but resigned to the fact that our sanity at not dealing with crowds is far more important than seeing this geyser or that building or those animals we again headed towards the park exit. Probably all of a half mile from the exit we came across another turnout and pulled in to take a look at what was on offer. 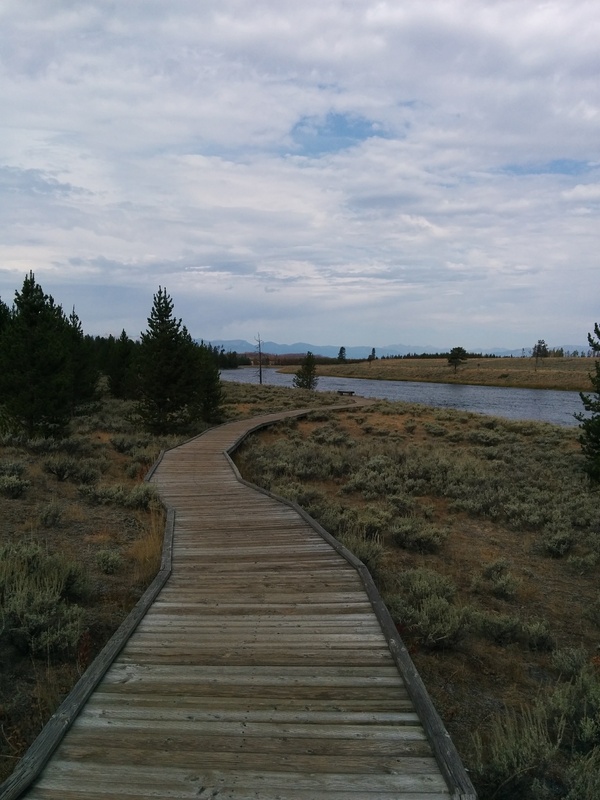 What we found was the Two Ribbons Trail a 3/4 mile (1.2 km) wheelchair-accessible boardwalk loop right next to the Madison River. 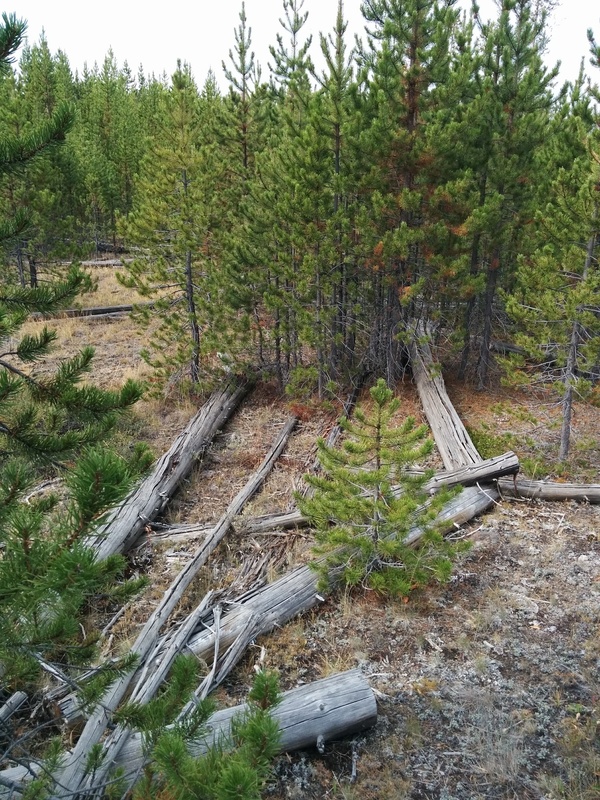 Along the gently rolling boards there are many benches for taking a break and quietly observing the differences between trees that escaped the 1988 conflagration, the charred remains of those that were burnt and the young(er) offspring of those that perished. 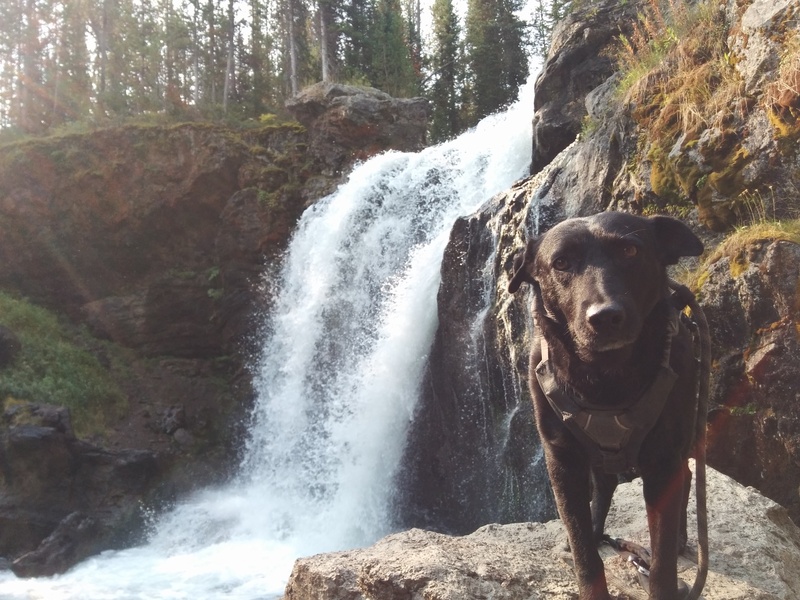 It was obvious that my appreciation for the cycle of destruction and rebirth in the park was not, at all, shared by Willow and so she sauntered ahead of me on the boardwalk escorting the squirrels from tree to tree and they chattered their annoyance and alarm at her predatory presence. In several spots where the boardwalk loops out from among the trees and passes right next to the river you might be lucky enough to see an otter or an osprey hunting for its next meal from among the overly abundant introduced fish species (rainbow and brown trout) or the far too rare native species of fish (Westslope cutthroat and Grayling). An otter saw Willow and gave her the otter version of an “up yours” by swimming up to the bank in front of us, chattering an obvious “catch me if you can, sucker” and then did an about-face to slip back into the water and swim away. Once we finished the loop we took one last, longing look at the river and then headed out of the park. We would have liked to have seen more of the iconic sights but what we did see was both beautiful and fascinating. 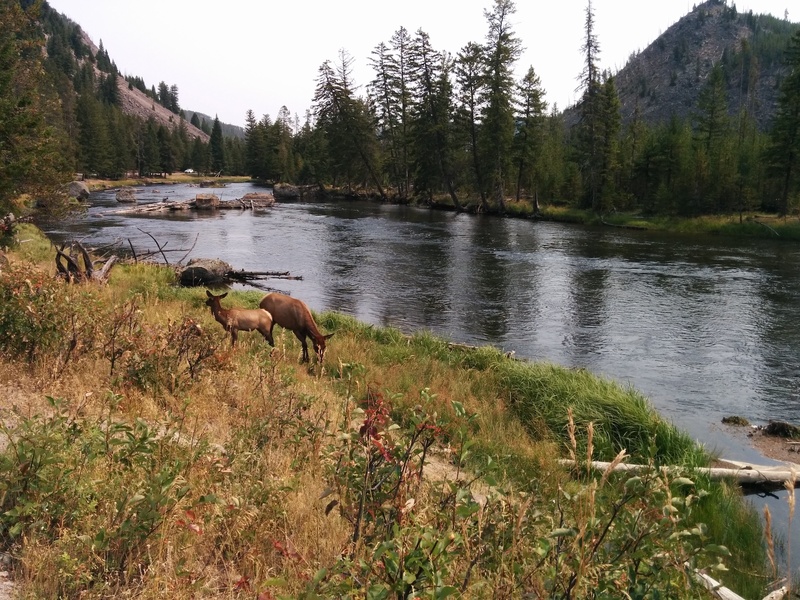 As one of the most visited National Parks, Yellowstone is handling the largest visitor load since its creation and obviously struggling to do so. Parking lots are regularly full with lines of cars, buses and RVs waiting for someone to leave so they can find a spot to park. Visitors on foot crowd boardwalks three across and are oblivious to considerate and efficient use of such impacted spaces. As this was the height of the visitor season (the 2nd most visited month) we expecting crowds but this has reached proportions that now make it unlikely you will have a fun, relaxing experience for the foreseeable future if what you try to do is go in a linear fashion from Site A to Site B, Geyser C to Geyser D, Pool E to Spring F…you get my drift. Our unsolicited recommendation to the National Park Service is to consider setting aside a single day a week and not allow tour buses into the park. Our learned recommendation to you, future visitor to the park, is to go out of your way to enjoy as much as the park has to offer in whatever order you see fit. If you can relax and have the time to explore the park more thoroughly a multi-day visit allows a much more in-depth experience. If you have the opportunity try and focus on visiting in the off-season or winter time. According to official NPS visitation statistics that means enjoying what the park has to offer in the months not including May – October. For those of you keeping score that means essentially winter. 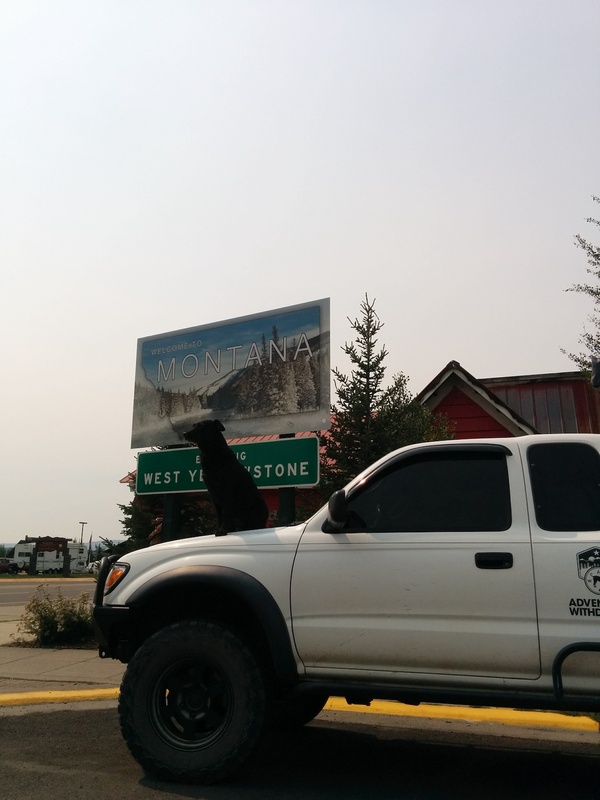 Hope to see you on a snowmobile there someday but, for now, our next adventures take us northward and in the direction of Glacier National Park. We’re heading back up into Oregon and home. As for what is next, catching up a bit on this site itself is paramount and we’d still like to explore Anzo-Borrego State Park thoroughly.